Pork was on sale at Kroger when I did my grocery shopping this week and Todd always likes pork chops so I bought a package. But I dont really like plain, old pork chops, so I needed a different way to use them. I had some peach-mango salsa in the fridge so I came up with this. Put pork chops and salsa in a plastic bag to marinate overnight in the refrigerator. Preheat oven to 375 degrees. Place pork chops on a baking pan and pour excess marinade over them. Bake for approximately 30 minutes until almost cooked through. Slice thinly and return to pan, sprinkle with cumin and chili powder and toss with marinade still on the pan, add more salsa if necessary. Return to oven for approximately 5 more minutes. 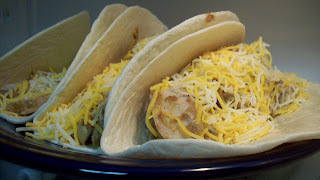 Assemble tacos with 1/4 each of the pork and cheese and microwave to melt the cheese if desired. (Sorry I forgot to take another picture after this point.) Add 1/4 each of the onion and diced peaches and top with fresh cilantro.